Designed for women, the Cordo jacket has a feminine silhouette and is built for the avid skier. When the conditions are perfect and you want a taste of the fresh snow and backcountry glide, this jacket has all the features you need. It is trendy and its composite design satisfies two winter sports premises: protection and insulation. The Dry Microloft insulation provides warmth using small, soft thermic balls, as puffy as feathers but functional in cold AND wet conditions. 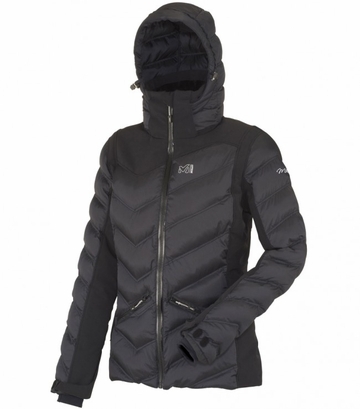 To back it up, the Light Down Proof outer face is water repellent and assure protection from rain and snow. The designer�s advice: �Pick this jacket in black and wear it as a lifestyle piece�, says Isabelle, head of collections. You can wear the Cordo jacket on your mountain AND on your urban adventures as well, since its powder skirt is removable.